Attention early adopters: Beta List is live! 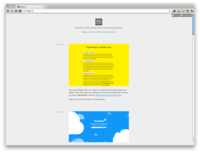 Beta List gives a curated overview of the latest beta lists across the web. Beta List is a blog of (potentially) interesting web apps that have yet to launch. By subscribing to their 'beta lists' you often get early access or be notified as soon as the service goes live. If you either get a kick out of checking out the latest internet startups, just want to reserve your account name or get inspiration for your own webapp Beta List is for you. Beta List is very similar to (and inspired by) The Museum of Modern Betas with the big distinction you will only find startups on Beta List that have not yet publicly launched and have a beta list available. BetaList lets early adopters, investors and journalists discover tomorrow's startups, today. The site has previously covered startups such as Pinterest, IFTTT and Mailbox before they launched and made it big. BetaList has featured almost 4,000 startups to date and is adding between 100 and 150 more every month. BetaList is a widely recognized resource to discover new startups and has been featured in publications like the New York Times, Forbes, TechCrunch, The Next Web, Business Insider and many more. BetaList partners with world-class companies like Stripe, Amazon, InVision and others to help early-stage startups go from idea to profitability. For $47 startups can purchase the BetaList Bundle which provides access to 22 hand-picked services ranging from prototyping software, educational resources, productivity tools, and more. Beta List and BV Capital as well as its European counterpart eVenture Capital have teamed up to provide the most promising startups published on the startup discovery site a chance to meet the VC firm that invested in companies like Groupon, Delicious, Sonos, Shopping.com, and many more.